"Why is my toddler such a picky eater? Eating solid food is still a new experience for your toddler. He may need time to get used to the various textures, colors, and tastes of new food. And because young children crave consistency and familiarity (from bedtime routines to afternoon snacks), most of them won't try new foods until you've served them numerous times.That said, this is a great time to teach your child to try new things, before he gets too set in his ways and before he begins to reject new foods as a way of asserting his independence (a distinct possibility as he nears his second birthday!). Offer a variety of healthy foods often, so he has the opportunity to dig in when he's ready — if not at lunch, then maybe during an afternoon snack. Your child has an innate sense of how much food his body needs to grow and be healthy, and it's up to him to decide what he's going to eat. The best thing you can do is to provide a wide variety of healthful foods in a positive, relaxed environment so that mealtimes will be enjoyable for everyone. • Serve a variety of good foods for your toddler to eat at each meal. When you do offer a new food, simply place it on your child's highchair tray without making a a big deal about it. Make sure the food you choose is age-appropriate. • Introduce new foods one at a time and in small amounts. Instead of offering an entire meal of unfamiliar foods, for example, offer standard fare or favorites along with something new. Always offer a meal that includes at least one thing you know your toddler likes. And try to schedule a new food when you know your child is hungry — a snack of mango slices when he has the afternoon munchies, for example. • Use toddler-size portions. A serving of bread for a 1-year-old is only 1/4 slice, and a serving of rice, potatoes, or pasta is only about 2 tablespoons — much smaller than an adult serving size. • Understand that some children's palates are more sensitive than others' and they simply won't like the texture, color, or taste of some foods. That's why a child might claim to dislike a food he has never even tried. Likewise, some children may reject a food because it reminds them of a time when they were sick, or because they have some other negative association with it. • Look for ways to boost the nutritional value of the dishes your toddler enjoys. Add some wheat germ or tuna to his macaroni casserole and little chunks of fruit to his favorite cereal, for example. • Resist the urge to offer sugary foods in an effort to get your toddler to eat more. You want to develop his sense of culinary adventure, not his sweet tooth! • Minimize distractions at the table. If a sibling is running around nearby, or a cartoon beckons from across the room, your toddler may have trouble maintaining interest in the food being served. Try to make meals relaxed and quiet. It's not realistic to expect a toddler to embrace a wide range of foods. In the long run, the example you set by serving and enjoying all sorts of healthy foods — at home and on the go — is one of the best ways to help your child learn to eat well. But for now, your toddler's decision to eat only a few things is his choice, and it's important to let him learn to make his own decisions about food from the get-go. "A child needs to be in control of what he eats," says Nancy Hudson, a registered dietitian at the University of California, Berkeley. That's because forcing a toddler to eat a food he doesn't like or a quantity he can't handle may set him up for problems later on: Children who are never allowed to make food decisions themselves (such as deciding when they're full) are at a greater risk for developing eating disorders or becoming obese later in life. What's more, your strategy will almost always backfire because forcing your toddler to try new foods will only make him more stubborn and less open to trying new things in the future.If your toddler seems to be eating nothing but cheese and crackers for days on end, don't worry. Start keeping a record of what your toddler eats and you'll probably find that he's hitting all the major food groups and getting the necessary nutrients over the course of a week. 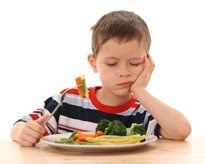 Studies from the American Dietetic Association show that children — even those whose parents consider them "picky eaters" — generally consume a wide enough variety of foods to meet their nutritional requirements. If you really don't think your toddler is eating well, ask your doctor whether it makes sense to give him a daily multivitamin. Don't panic if it seems like your toddler isn't growing fast enough. Children don't always grow at a steady pace and there will be times when your child doesn't seem to be growing at all. Your toddler won't grow at nearly the same rate as he did in his first year of life. Keep in touch with your doctor if you're concerned about your child's weight gain, but don't convey your concerns to your child. If you're constantly hovering at mealtime, or wheedling, cajoling, and counting calories, he's likely to become even more resistant to eating."